For the fourth year in a row, Ilyashev & Partners Law Firm has affirmed its leading positions in Litigation and Bankruptcy practice areas. The Firm was included into the list of TOP-5 law firms in the spheres of International Trade, Aviation, Maritime & Shipping according to the results of 16th national independent research Ukrainian Law Firms 2018. A Handbook for Foreign Clients. • Olena Omelchenko was recognized as TOP-3 leading individuals in International Trade: Trade Remedies/WTO. • Oleksandr Fefelov – Antitrust/Competition. The research Ukrainian Law Firms 2018. 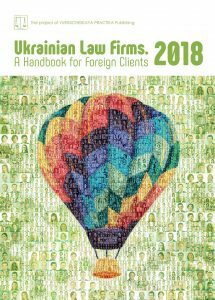 A Handbook for Foreign Clients is published in the English language and represents major Ukrainian law firms in key areas of law. The Handbook is a single source designed to assist foreign companies in choosing their partners by giving an assessment of development and achievements of the internal legal market. The Handbook is a project of Yuridicheskaya Practika Publishing House.